The method chosen depends on terrain, target presentation, type of target, and tactical situation. a. Distribution of Fire. To be effective, fire must be distributed over an entire target. Improper distribution results in gaps between beaten zones and allows some of the enemy to escape or to use guns without effective opposition. (1) Factors Affecting Distribution of Fire. No fixed rule can be given as to the widest target that a single MK 19 may effectively engage. Ideally, the target should be no more than 100 mils wide. The traversing screw on the T&E mechanism limits the gun's traverse unless the traversing slide lock lever is unlocked. Wider targets require more traversing time, which prevents the gunner from placing a continuous volume of fire on the whole target. The engagement of a wide target by a single MK 19 requires excessive ammunition. (2) Fire Unit. This consists of a pair of MK 19s. If possible, at least two guns should be assigned to the same mission, although sometimes a single MK 19 may be effective. The assignment of a pair to a single mission ensures continuous fire in case either gun is put out of action. Two guns can provide a great volume of fire on the target, and can reduce the time required to cover it. (3) Manipulation of the Tripod-mounted MK 19. Traversing fire is moved in 5-mil increments. The MK 19s are fired after each manipulation to ensure the beaten zones overlap. Searching fire is often used on level or evenly sloping ground. 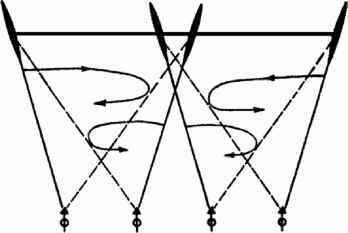 When the ground is irregular, however, the amount of search to apply between bursts in order to ensure overlap of the beaten zones is determined by observation. 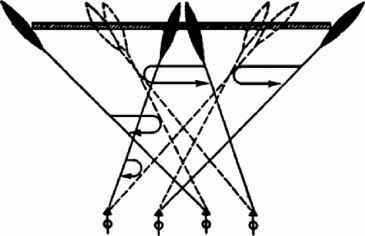 c. Engagement of Linear Target. There are several ways to engage a linear target. The method used is chosen based on the number of MK 19s available and whether or not the entire target is visible to the gunner. TROOPS EXTENDING FROM DEAD TREE RIGHT 20 MILS. FIRE (given after the gunners announce "Up"). (2) Linear Engagement with Two MK 19s. 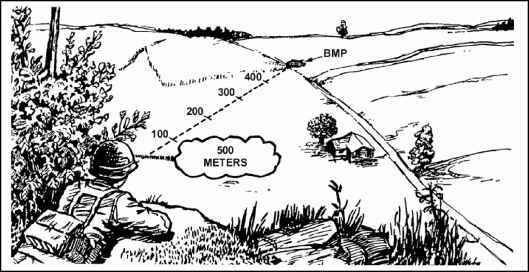 A linear target may be engaged two ways when a pair of MK 19s is used, depending on the width of the target in mils. TROOPS, EXTENDING FROM DEAD TREE RIGHT TO CLEARING. FIRE (given after the gunner announces "Up"). Figure 5-11. Traversing method, pair of MK 19s, target 100 mils or less in width, both flanks visible. TROOPS, EXTENDING FROM DEAD TREE RIGHT TO CLEARING, ROW. NUMBER 1, RIGHT ONE-THIRD; NUMBER 2, LEFT TWO-THIRDS. Figure 5-12. Traversing method, pair of MK 19s, target more than 100 mils in width. (3) Linear Engagement with Four MK 19s. Four guns may be needed to concentrate a heavy volume of fire into a wide target area. Methods used are similar to the ones described for a pair of MK 19s. The width of the target in mils determines which type of linear engagement is used. • Each pair of MK 19s engages the whole target (Figure 5-13). 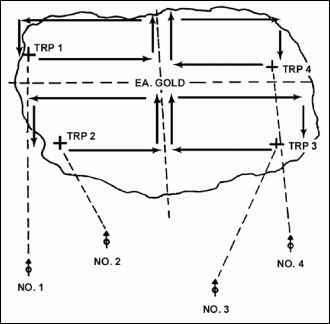 Figure 5-13. Four MK 19s, target 100 to 200 mils in width. • Each pair of MK 19s engages half the target (Figure 5-14). (b) Target Greater than 200 mils in Width. The leader may assign part of the target to each gun in this case. The target may be divided in half for each fire unit or in four parts, one for each MK 19 (Figure 5-15). Figure 5-15. Four MK 19s, each pair engaging part of target with extreme width. (4) Linear Engagement with the Flanks of Target Not Identifiable. The target may be located by firing tracers from an observer's gun, laying MK 19s, or using a reference point. The reference point may be in or near the target area. 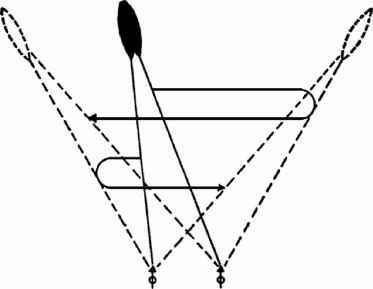 (a) When a reference point is outside the target area, the leader may direct the gunner to it by announcing the interval (right or left, long or short) between the reference point and the target. With the MK 19 on a tripod mount, the gunner measures the interval right or left between the reference point and the flank of the target by laying on the reference point, with the sights set at the range to the target, and then shifting the MK 19 the designated number of mils. The interval long or short may be measured in mils using the computed search method, or it may be estimated in meters. When the gunners lay each MK 19 on its respective flank, they adjust fire and engage the target. WATCH MY BURSTS (OR TRACERS). (Lays and fires MK 19 at left flank) LEFT FLANK. (Lays and fires MK 19 at right flank) RIGHT FLANK. FIRE (given after gunners announce "Up"). RIGHT SIX ZERO MILS; DROP THREE FIVE ZERO METERS (or drop so many mils, if using computed search). TARGET: TROOPS EXTENDING RIGHT FIVE ZERO MILS. Figure 5-16. Two MK 19s, deep enfilade target, ends not visible. TARGET: TROOPS EXTENDING RIGHT TWO ZERO MILS, LEFT, THREE ZERO MILS. FIRE (given after the gunners announce "Up). d. Engagement of Deep Targets Using Searching Fire. There are several ways for leaders to use two guns to engage a stationary deep target, depending on whether the ends of the target are visible to the gunner. If the target location is unknown, the computed search method may be used to engage the target. A deep target that is stationary or that has limited mobility may be engaged with searching fire. (1) Target Ends Visible to Gunner. The Number 1 gun is adjusted first on the near end and the Number 2 gun on the far end. Each gunner searches to the opposite end and back again repeatedly, until told to cease firing (Figure 5-17). Target depth is considered in determining sight settings. The command is SEARCH. Figure 5-17. Two MK 19s, deep enfilade target, ends visible. TROOPS ALONG RIGHT EDGE OF WOODS. NUMBER 1, SIX HUNDRED; NUMBER 2. NINE HUNDRED. (2) Target Ends Not Visible to Gunner. 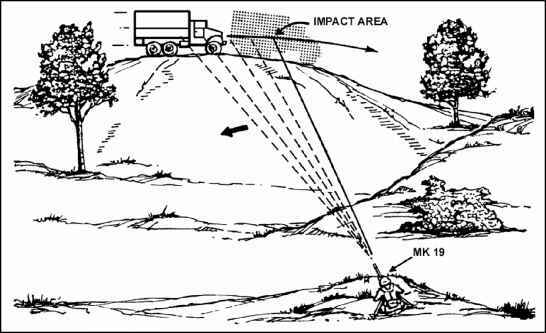 The target may be located by having an observer fire tracers at the target, by laying the MK 19s, or by using a reference point. The reference point must be visible to the gunner and in the vicinity of the target. When a selected reference point is outside the target area, the leader may direct the gunner to the target and announce the interval to the right or left (long or short) between the reference point and the target. If the MK 19 is on a tripod, the gunner lays on the reference point with the sights set at the range to the midpoint of the target; he measures the interval and shifts the appropriate number of mils. Using the computed search method, the gunner may measure the long or short interval in mils, or he may estimate the interval in meters. When the gunners lay their MK 19s on the right or left flank (near or far end), respectively, they adjust fire and engage the target. When the gunners lay their MK 19s on the announced release point (initial aiming point), they set their sights at the range to the reference point, and adjust fire. The gunner on the Number 1 gun searches down the designated number of meters (or mils), firing after each manipulation until the gun is set on the near end of the target. The gunner on the Number 2 gun searches up the designated number of meters (or mils), firing after each manipulation, until the gun is set on the far end of the target. When each gun has reached the near or far end, respectively, the gunners reverse the direction and both search up and down between the two limits, covering the entire target, until told to cease firing. • Reference point in target area, ends of target not visible to the gunner. TARGET: TROOPS EXTENDING SHORT ONE HUNDRED YARDS, LONG TWO HUNDRED YARDS. SIX HUNDRED (range to reference point). FIRE (given after gunners announce "Up"). • Reference point outside target area, gun on tripod. RIGHT THREE ZERO MILS; ADD TWO HUNDRED METERS (or add so many mils, using computed search). TARGET: TROOPS EXTENDING OVER TWO HUNDRED METERS (or long so many mils, using computed search). FIRE (given after gunners announce "Up"). f. Engagement of Moving Targets. Due to the slow flight of the MK 19 round, it is not practical to engage moving targets using the track-and-lead methods of engaging moving targets. In order to effectively engage moving targets with the MK 19, use the trapping method of engaging targets. The gunner chooses an aiming point forward of the target and on the target path, and presses the trigger before the target comes into the sights. After starting to fire, the gunner moves the MK 19 slowly toward the target. The target moves into the impact area, and is "trapped." The gunner must begin firing before the target is in the sights or in the impact area (Figure 5-18). (1) Engagement of Deep Target Moving Away from the MK 19 Position. If the target i s moving rapidly away, both gunners lay their MK 19s on the far end of the target with the range set to that point, and search up. (a) One MK 19. The gunner lays the MK 19, adjusts on the near end of the target with a range to the target's midpoint, and searches up and down the entire target. When a reference point within the target area is announced, the gunner lays on it with the range to that point. The gunner adjusts fire and searches up and down the entire target, beginning with the near end, until told to cease firing. (b) Two MK 19s. The gunners lay both guns on the near end of the target, set the sights on the range to that point, and search down. The manipulation element of the fire command for a rapidly approaching or receding target is BOTH WEAPONS; FAR (NEAR) END; SEARCH. (c) Four MK 19s. Each pair of gunners engages the target as if they were acting alone. 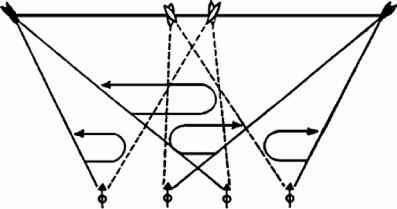 If one pair must be switched to a different target, the other pair continues to cover the original target. A deep target should never be subdivided since the elevating mechanism on the M3 tripod allows enough search to cover any deep target within the maximum effective range for direct lay (1,500 meters). g. Engagement of Linear Target with Depth Using Traversing and Searching Fire. The method used depends on the number of MK 19s available and whether the flanks of the target are visible to the gunner. (1) One MK 19, Flanks Visible. The gunner lays initially on the near flank of the target with range set to the midpoint, adjusts fire on the near flank, and traverses and searches back and forth, covering the entire target, until told to cease-fire. (2) Two MK 19s, Flanks Visible. Gunners use the same method as for engagement of a deep linear target: they must search to keep the center of impact on the target. The leader determines the range for the initial fire command the same as for a deep target (Figure 5-19). Figure 5-19. Two MK 19s, linear target with depth. (3) Four MK 19s, Flanks Visible. Gunners use the same method for two pairs as is used for two guns. 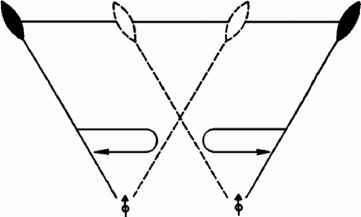 If one pair must be switched to another target, the other continues to cover the original target. (4) Flanks Invisible. The leader may designate the target using a reference point. However, a reference point in the target area is not used as an initial aiming pointbecause of the difficulty in describing an oblique target. (5) Fire Commands. The leader may use the following fire commands for linear targets with depth. TROOPS EXTENDING FROM BLACK STUMP RIGHT TO LONE PINE. SEVEN HUNDRED (midrange). TRAVERSE AND SEARCH. RAPID. FIRE UNIT, FIRE MISSION. FRONT. TROOPS TO THE RIGHT OF RED BANK. SEVEN HUNDRED (midrange). TRAVERSE AND SEARCH. RAPID. FIRE (given after gunners announce, "Up"). TROOPS EXTENDING FROM TRUCK, RIGHT TO BRIDGE. NUMBER 1 (and 3 if four MK 19s are engaging the target), SEVEN HUNDRED. NUMBER 2 (and 4 if four MK 19s are engaging the target), ONE THOUSAND. TROOPS EXTENDING FROM CROSSROADS TO HOUSE. COMBINED SIGHTS; NUMBER 1, 1,350 METERS; NUMBER 2,1,250 METERS. • Large troop or mechanized formations. • Targets that must be suppressed (if the exact positions are unknown or are not visible). • Large kill zones or engagement areas for which predetermined fires have been planned. j. Engagement of Target Using Massed Fires. Leaders can mass fires in both offensive and defensive operations, depending on the time available to plan and conduct the engagement. (1) Defensive Operations. There are two types of defensive operations. AREA: ENEMY COMPANY ENTERING EA GOLD. FIRE (given after the enemy is completely within the engagement area and the gunners announce "Up"). • Defense, Time a Factor. Leaders may not have the luxury of registering their MK 19s on TRPs before chance contacts due to time factors or the elements of surprise. However, the lethal effect of massed MK 19 fire on an area target should not be overlooked. Units should develop and practice SOPs that enable them to engage large-area targets on quick notice. For example, the leader may give each MK 19 a section or quadrant for all quick area engagements. He may assign the upper left side of the target to the Number 1 gun, the upper right to Number 2, and so on. Figure 5-20. Use of massed fires, time not a factor. (2) Offensive Operations. Massing fires into an area target can also be useful for offensive operations. During a movement to contact or an attack where time is a factor, massed fires may be used to suppress a suspected or actual enemy position, allowing the unit to flank or bypass the enemy. 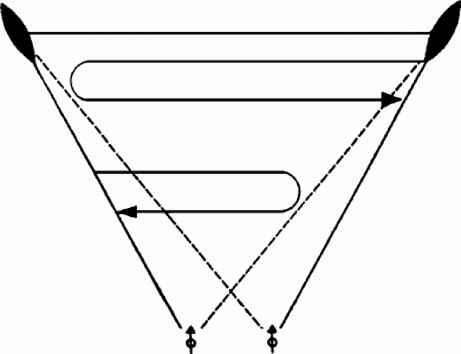 Although fast target acquisition and volume of fire are primary goals, the leader should subdivide the target for control, and adjust fires for greatest effect. Massed fires are especially useful in support of an attack where time is not a factor, which may require the use of overhead fire. Is the m242 more lethal than Mk19?